The Conference Proceedings will be included in the IEEE Interactive Electronic Library (IEL) as part of IEEE Xplore. All authors who have been accepted must register for the conference and attend the conference to present their paper. Authors who do not attend the conference to present their papers, or arrange for a co-author or knowledgeable colleague to present their paper, will not have their paper published in the IEEE IEL and IEEE Xplore, per IEEE policy. Online Registration is now open - You MUST register before uploading your final paper. Papers will be included in the proceedings only if at least one author has registered and paid the registration fee by March 29, 2015. One full IEEE member or non-member registration (student registrations do not apply for this) covers only one (1) paper. To guarantee inclusion in the proceedings of more than one (1) paper, the author must pay a USD $50 surcharge for each paper in excess. If an author has more than 3 accepted papers, an additional full registration will be required for the 4th paper (5th and 6th papers would then each incur the USD $50 surcharge). You will be required to enter your registration code prior to uploading your paper. If you need to register by bank transfer, please contact Janell Sims, MEMEA 2015 Registration Manager. i. Upload the source file (containing your paper) for conversion. ii. 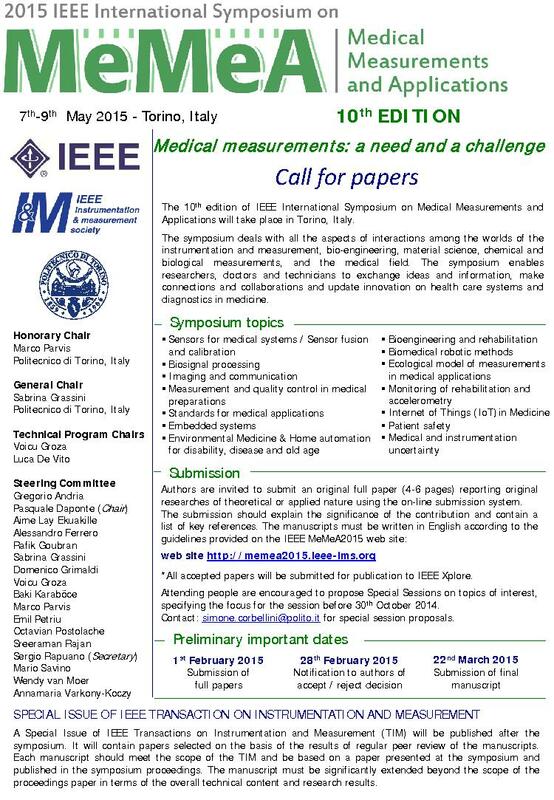 Receive by e-mail the IEEE Xplore-compatible PDF of your paper. IEEE is enforcing strict copyright rules. For your convenience, the copyright form is made available electronically through EDAS. To access the copyright form, select the icon in the copyright column within your paper record. Authors who are not authorized to sign a copyright transfer form, should download the paper version of a copyright transfer form, fill it in, and ask an authorized person to sign it. Then, send the completed form to the MEMEA 2015 Conference Manager by email or fax: +1 (352) 872 5545. Bypass the “Review Manuscript” option in your EDAS paper record and upload your paper directly to “Final Manuscript” by selecting the upload icon. Submissions are due by March 29, 2015.